If you’ve been reading my blog for a while then you may have cotton on to the fact that hubby and I are big Red Dwarf fans. He asked me out because I mentioned I loved Red Dwarf, he proposed at a Red Dwarf convention and we walked up the aisle as a married couple to the Red Dwarf theme tune being played on the harp (yes seriously!). Now it depresses me that the harpist at our wedding didn’t know what Red Dwarf was. So in case you’re from that generation*, I shall explain what the show is. You should know that Dave Lister is a space bum – a lager drinking curry fanatic with questionable personal hygiene. Rimmer is his polar opposite. A space corps fanatic who tries to be prim and proper and always wears his uniform. Cat is a fashion fanatic and has hoards of clothes. In series 1 and 2 we follows the adventures of the crew as thy try to make their way back to earth. By series 3 they come across Kryten (a neurotic service mechanoid) who becomes a main character. And for series 3 to 5 we continue to see the crew’s adventures on Red Dwarf. At the end of series 5 the crew loses Red Dwarf (Lister’s fault since he couldn’t remember which planetoid he parked it behind. They’re all the same – “blue, green and planetoidy”). So in series 6 and 7 we see the crew travel around space in Starbug trying to find Red Dwarf. In series 7 Rimmer leaves the crew to become the next incarnation of Ace Rimmer – his heroic alternate version who travels trough time and space.. He is replaced by Kochanski – Lister’s ex girlfriend from another dimension whom they come across in dimensional tear. Complicated stuff! By series 8 we’ve learnt that Lister had not lost Red Dwarf but rather that the shop had been stolen from them. It is revealed that Kryten’s repair nano bots have escaped and deconstructed the ship. Kryten recaptures the nano bots and instructs them to recreate Red Dwarf. 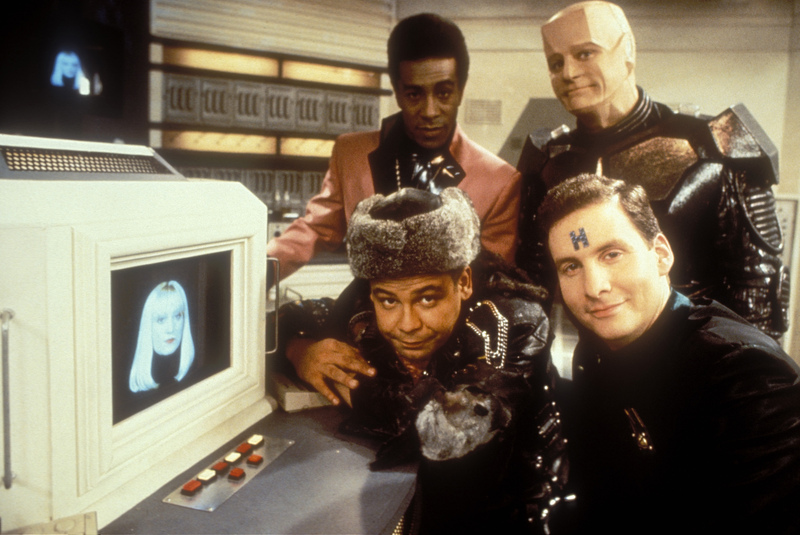 And so in series 8 the crew return to a rebuilt Red Dwarf complete with “rebuilt” crew. We therefore see the welcome return of Rimmer! Of course as he is a reconstruction he is no longer a hologram. At the end of series 8 metal eating virus has started eating the shop and so the crew evacuate. The last scene of the series show Death turn up to take Rimmer who promptly knees Death in the groin and walks off to save the ship. And that was the end of the show as far as my childhood was concerened. In 2010 the TV channel Dave commissioned a three part special series where the crew are infected by the female version if the despair squid. The crew are put in a happiness coma by her infection as we see them return to Earth in the year 2010. After their adventures on Earth they recover from the coma and are back on Red Dwarf. If truth be told I wasn’t that keen on this special series. I didn’t really find it in keeping with the show. However I loved “Carbug”! I was probably in the minority with regards to th show as viewing figures soared – well they would do, it was a cult classic! So after it’s success Dave commissioned series 10. In series 10 we see the crew back on Red Dwarf (minus Kochanski who was written out in the 3 parter). Rimmer for some reason is now a hologram again and we have lost Holly. I found this series to be more in keeping with the original 8 series. It was successful and in May this year they announced that Dave had commissioned another 2 series which are to be filmed end of this year/early next year and we applied to get audience tickets. Guess what?! WE GOT AUDIENCE TICKETS!!! So on my birthday next year, I will be in Pinewood Studios, watching episodes of Red Dwarf being filmed. It’s like a dream come true! Are you a Red Dwarf fan? Have you ever heard of it? Ahh don’t worry we have plenty of interests we don’t share – he’s very much into Warhammer and I just don’t get it!